Welcome to over 3 feet of steel terror. That's right. 43 inches of nightmares for your enemies. 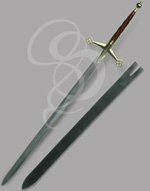 It is, quite possibly, one of the finest greatsword that we offer. And the answer to our most heartfelt prayers. Behold, the Great Sword of War. Behold and worship. 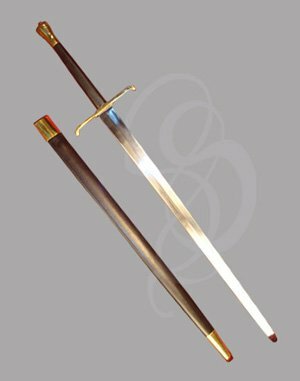 This sword is a magnificent piece of steel. Long and beautiful, with a 32 Inch blade and a massive 8 inch grip. Oh, and did we mention that it's under 3 pounds? Yeah, we couldn't believe it either. Bought about three years ago, and still may be the best "feeling" sword I own. I paid extra to have them sharpen it, and even though it is not tempered, it still cuts well and holds it's edge very well. If they ever decide to offer a tempered one I'm a buyer for sure! 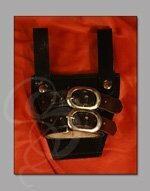 Previously had posted pictures on their facebook page with the re-wrapped leather handle with added risers I did. 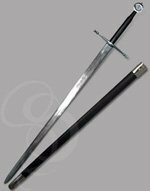 A great sword to hang on your back at the Renne Fest.